This week, we launched HealthYear, a new tool to help you start the year off on the right foot. The landing page allows users to choose a goal (eat better, sleep more, stress less, run a 5k, booze less, or get stronger) and then receive inspiring and informative content to help them along! We're all about the resolutions as of late, and learned just how to make them stick. 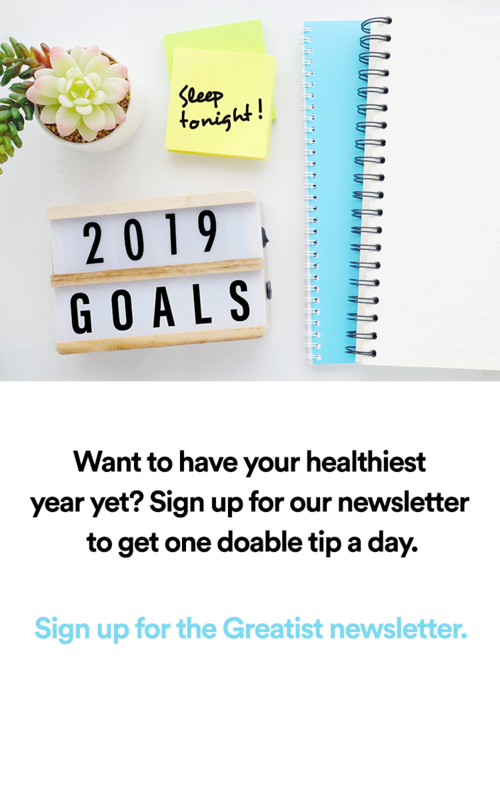 And be sure to check out some healthier choices sent in by greatists — from pumping out thousands of push-ups to cutting back on the sugar. The Best and Worst Foods to Cure a Hangover Feeling blah after a wild night on the town? Don’t let a hangover ruin your day! Some foods can help cure a hangover, while others just make the problem worse. Make Your Resolutions Stick with HealthYear Want an extra push to make sure those resolutions come to life? HealthYear, a new tool from Greatist, can help! Healthy Fat? Higher BMI Linked to Lower Risk of Death New research suggests being slightly overweight or obese is actually associated with a lower risk of dying. Can Exercise Make Us Smarter? Hit the books, or hit the ground running? Exercise may also boost brainpower — no number two pencils required. Sportaneous App Helps Find and Book Local Fitness Classes Exercise is tough, but picking a place and time to work out shouldn’t be. Sportaneous, a new app that recommends local fitness classes based on users’ personal preferences, want’s to make it easier. Raining? Running Will Keep You Drier Than Walking [Video] So it’s raining and you don’t have an umbrella. You’ve got to get from point A to point B and try not to get soaked. What do you do? Science says run. Fig Wellness App Takes a Holistic Approach to Health Fig is a free mobile app that guides users along a customizable wellness journey by focusing on more than just the physical things. Read on to see if this app is worth your download in 2013. 12 Unexpected Reasons to Drink More Water this New Year It’s finally time to put down the wine glass. Here’s why you should make water your new best friend in 2013. New Way to Puff Rice Puts Protein Back in Cereal Puffed rice isn’t the most nutritious product out there. Luckily, scientists have found a new way to pump up the health benefits (and the protein) of the grain. Get ready for some health-jacked foods. Losing Weight With Holistic Techniques GUEST POST: Weight loss isn’t just about cutting calories and hitting the gym. For Per Wickstrom, the road to better health involves the whole mind and body, meaning techniques as varied as meditation, positive messages, and visualization. 13 Stories You Missed While Away for the Holidays The last 10 days have been filled with fun, food, lots of family, and probably very little time surfing the web. But as we all know, the Internet never sleeps — so here’s what you’ve missed. Healthier Choices for the New Year #imagreatist 10,000 pushups, reducing sugar, and reading nutrition lables. These are just some of the awesome healthier choices the greatist community is making in 2013. Always Overeating? Food Can Be Just as Addictive as Drugs Research suggests that food addiction may not be just another excuse to overeat. A new study finds strong similarities between food and drug addictions. College Women Binge Drink More Than Men, Study Shows New research from Spain suggests college students have some pretty unhealthy habits. Problems include binge drinking, drug use, and limited exercise — and women are especially at risk. The Greatist Table: 5 Healthy Brunch Recipes from Around the Web Ring in 2013 with a healthy, delicious brunch. These five recipes are a great way to celebrate while sticking to that New Year’s resolution to get healthy. Learn How to Tolerate Some Fools This New Year's Eve New Year’s is a time to cut loose… and also a time to learn how to better tolerate the more foolish among us. Take some playful wisdom from British critic James Agate. This Week's News That Can Actually Change Your Health Haven’t had time to keep up on the news this week? Not to worry — we’ve summarized the top news stories that could significantly change our health habits. Our Brains Are Weird: Hot Chocolate Tastes Better In Cream Cups Want to make a better, taster cup of hot chocolate? Just... put it in a different cup? We examine a new study that links color to taste. Recipe: Lentil and Goat Cheese Casserole For a healthy hearty and decadent casserole, try this protein-packed lentil-based dish. 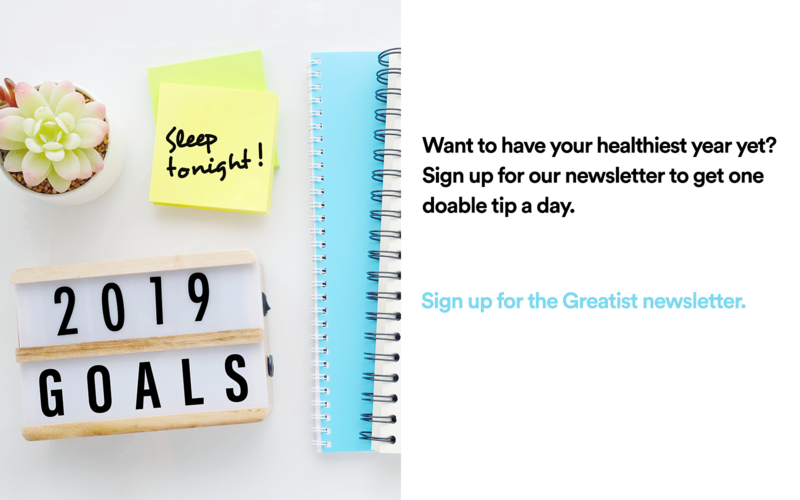 The Secret to Better Sleep [Infographic] It’s National Sleep Day, and Greatist has the need-to-know tips and tricks to help get you snoozing better than ever. Friday Inspiration: New Year, New Goals, New You It’s a whole new year, which means more opportunities than ever to nail those resolutions, achieve new goals, and be a whole new you. The Surprising Health Benefits of Anger Don’t get glad — get mad. Research says it’s good for you. But it’s still important to learn how to cope with anger in healthy ways. Read on to learn how. The New Key to Office Productivity? Walking Want to boost productivity in the workplace? Employers, take note: Just getting workers to walk more can up output, not to mention make the office a healthier (and happier) environment. The New Rules for New Year's Resolutions Resolutions and goals are as much about internal mental states as the external goal. Learn how to reframe your mindset for maximum success. What if You Danced Like Nobody's Watching at a Baggage Claim? [Video] This girl did. Check out two minutes of unadulturated dancing in an airport. We're talking arm flailing, hand jiving, and no shame.